Owing to the the initiative of the Ministry of Education, Science, Culture and Sport of Georgia , together with the National Agency for Cultural Heritage Preservation of Georgia, and the support of “Cartu” Fund, the renovation process of one of the most important monuments of Georgia is coming to an end. It is important to note, that this rehabilitation is one of the most complex and large-scale projects in the history of modern Georgia. 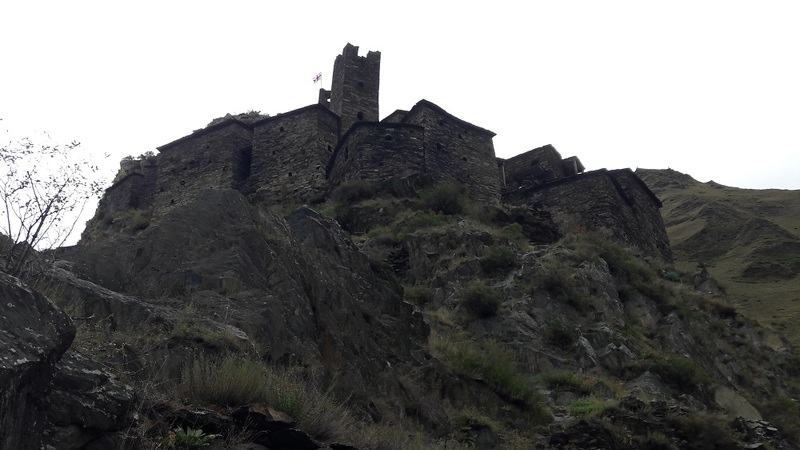 The completion of the project foresees the complete rehabilitation of the upper zone of the village Mutso, in conjunction with renovating the relevant infrastructure of the fortress. The authentic look with all its corresponding elements will be returned to the fortress. Within the scope of the renovation stages, the fortress and its towers in the middle and lower areas were restored. Additionally, the stained and damages facades were properly waterproofed, whilst strengthening the roof structure and traditional stone slabs. Moreover, up to 20 castle towers were restored. During the project, stone stairs, roofs, terraces were also restored. The oak door with the traditionally crafted lanterns, unique to the region, is preserved. It is noteworthy, that during the entire renovation period, all the traditional materials were used, which is trully authentic to the region. Despite the critical state of the rocky complex, considering the location of the monument, its structure, architecture and the climatic conditions of the region, the conservation of the mud could not be done for years, causing the structural breakdown of the monumental architecture. In 2014, with the support of the Ministry of Education, Science, Culture and Sport of Georgia and the National Agency for Cultural Heritage Protection, a large project for restoration and survival of mud started with the financial support of Fund - "Cartu". During the first two years of the rehabilitation process, the budgetary expenditure of the state agency in 2014-2015 amounted to 1,450,000 GEL. During the next 3 years, the total amount of expenses incurred by the private charity fund amounted to 1,215,000 GEL. *Mutso from the ancient times was presented as a united, fortification and defensive system, connected with the roads coming from North of Georgia. This is an authentic complex, constricyed in Late Medieval times. The village Mutso is located in Mtskheta-Mtianeti region, in Dusheti municipality, neighbouring with the historical Khevsureti region, on the banks of Artodi River (Ardotistskali).